The list of lane closures on some of the busiest highways in the Philadelphia region will grow next week. For all of the planned road closures, motorists are advised to use an alternate or allow more time for travel in the work areas because significant backups and delays will occur. Contractors' schedules are dependent on the weather and subject to change. With Flyers and 76ers games at home (Wednesday and Thursday, respectively) fans should be aware that westbound I-76 will be reduced to a single lane next week near 30th Street in Philadelphia, then closed completely overnight. 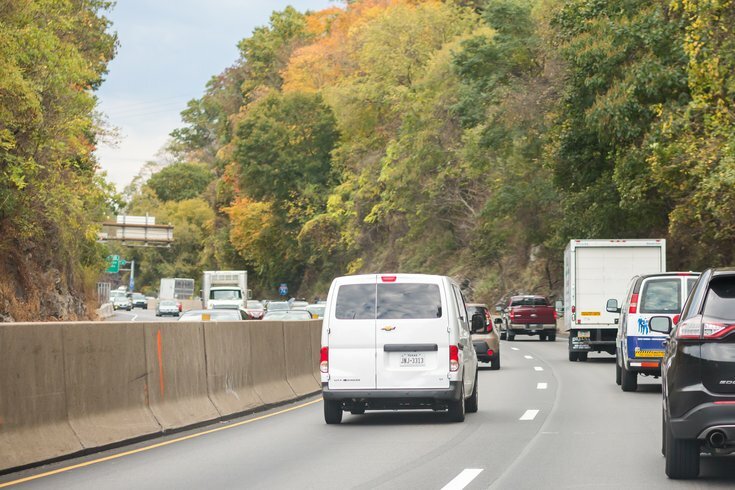 From Monday to Thursday, from 9 to 11 p.m., just a single westbound lane of the Schuylkill Expressway will be open. All westbound lanes will then close each night from 11 p.m. to 5 a.m. the following morning between the South Street and Interstate 676 interchanges. During the overnight closure, westbound I-76 traffic will exit at 30th Street and continue on Schuylkill Avenue to the ramp to westbound I-76 at Market Street. In addition, the ramp from westbound I-76 to 30th Street may close periodically between 9 and 11 p.m. each night during the planned operations. When the ramp is closed, motorists will be detoured west on I-76, east on I-676 to the 22nd Street Exit, north on 22nd Street to the ramp to I-676 west, then east on I-76 to the 30th Street Exit. The lane closures are necessary for removal of sections of the protective shielding in place on the underside of the viaduct carrying Schuylkill Avenue over the expressway between Walnut Street and Market Street. Motorists who travel I-76 and U.S. 1 in Philadelphia and Bucks County will encounter lane closures as part of work to repair guide rails, barriers and attenuators, according to PennDOT. More than a dozen lane closures are scheduled next week on parts of I-95, I-76 and U.S. 1 for bridge inspections. The inspections are part of PennDOT’s program to inspect bridges at least once every two years to ensure the safety and overall condition of the structures. On Tuesday morning, the right lane of U.S. 422 is scheduled to close on westbound U.S. 422 over Porter Road between the Sanatoga and Armand Hammer Boulevard interchanges in Lower Pottsgrove Township, Montgomery County, for soil boring, PennDOT said. The right lane closure will be in place weekdays from 9 a.m. to 3 p.m. through Friday, April 5. A section of Girard Avenue at the Interstate 95 interchange in Philadelphia and a section of the southbound I-95 ramp to Girard Avenue will be closed during the day next week for construction on the west half of the Aramingo Avenue overpass. From Monday to Friday, from 9 a.m. to 3 p.m., Girard Avenue will be closed between Aramingo Avenue and Richmond Street. Eastbound Girard Avenue through-traffic will be detoured east on Frankford Avenue and north on Delaware Avenue to Richmond Street. Girard Avenue will remain open to local traffic between Frankford Avenue and the overpass, located just east of Susquehanna Avenue, PennDOT said. Northbound Richmond Street motorists heading for westbound Girard Avenue will be directed north on Aramingo Avenue and follow the local detour signs to Girard Avenue. Southbound Richmond Street motorists heading for Girard Avenue will be detoured west on Lehigh Avenue and south on Aramingo Avenue to Girard Avenue. In addition, the section of the southbound I-95 off-ramp that passes under Aramingo Avenue and goes directly to Girard Avenue will be closed Monday through Wednesday from 9 a.m. to 3 p.m. Motorists using the southbound I-95 off-ramp heading for Girard Avenue will be directed to use the off-ramp spur to southbound Aramingo Avenue, then south on Delaware Avenue and north on Frankford Avenue to access Girard Avenue. All scheduled activities are subject to change depending on weather conditions. Aramingo Avenue overpass is being rebuilt a half-at-a-time. The east half of the overpass will remain open to southbound Aramingo Avenue traffic heading for southbound Delaware Avenue or to the ramp to southbound I-95 at the Girard Avenue Interchange. The bridge replacement is part of an ongoing $312 million project through 2023 to replace the southbound I-95 viaduct between Palmer Street in Fishtown and Ann Street in Port Richmond, reconstruct and improve the southbound on and off-ramps at Girard Avenue, and rebuild the southbound I-95 pavement between Ann Street and Allegheny Avenue. Nighttime double-lane closures on I-95 will continue next week. Double lane closures are scheduled from 9 p.m. to 5 a.m. between the Washington Avenue/Columbus Boulevard (Exit 20) and Interstate 676/Callowhill (Exit 22) interchanges in Philadelphia for work on a project to install a new underpass lighting system in the covered section of I-95 near Dock Street. Moreover, motorists may encounter periodic 15-minute traffic stoppages on northbound and southbound I-95 along that same stretch on Monday and Tuesday from 9 p.m. to 5 a.m.
One of Bucks County's busiest intersections will see more lane closures next week. Lanes in both directions will be closed on U.S. 1 and Street Road (Route 132) in Bensalem Township for work to widen and improve U.S. 1 and reconstruct the interchange. From Monday to Friday, from 8 p.m. to 6 a.m., northbound and southbound U.S. 1 will be reduced to a single lane between Rockhill Drive and Old Lincoln Highway. Street Road will be reduced to a single lane in each direction between Old Lincoln Highway and Kingston Way.